Sail through the untouched frontiers of Alaska during this 7-night cruise that takes you to some of the most picturesque scenery in the country. Get up close with whales, dolphins and maybe even a few bears. Launched in May of 2010, the Nieuw Amsterdam was built as a sister ship to the popular Eurodam and sailed its maiden voyage from Venice in July, 2010. The ship, inspired by New York City art and history, was refurbished in 2017 with brighter interior spaces and fresh carpeting in public rooms. The Nieuw Amsterdam has an impressive art collection valued at more than $3 million. A medium-sized cruise ship carrying 2,106 passengers and 929 crew members, the Nieuw Amsterdam has entertainment options that rival a much larger ship. 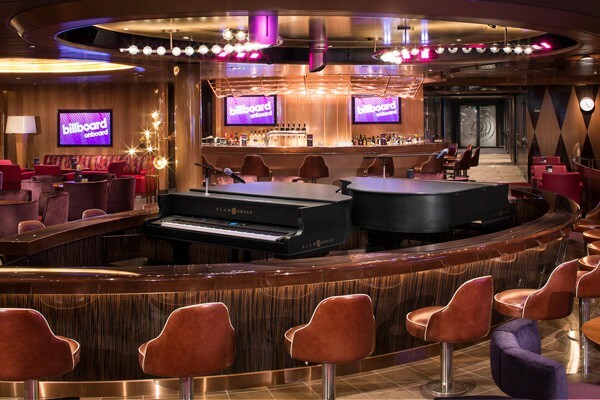 The Music Walk™ creates a trio of musical venues within a short walk of each other on Deck 2. From the orchestral beauty of the Lincoln Center Stage to the familiar hits of B.B. King's Blues Club to the sing-along fun of Billboard Onboard, you're sure to find a musical venue you'll enjoy. Another fun feature of this ship is the availability of Holland America's Navigator, an app that lets passengers check the daily schedule, book dinner or excursion reservations and even chat with travel companions, all without paying for internet connection. From November to March the ship sails the Mediterranean Sea and from April to October she operates week-long cruises from Vancouver, British Columbia to Alaska and back. The ship's 11 enclosed passenger decks include six stateroom types, and some are equipped with sofa beds for additional guests. The beds are Holland America's signature Mariner's Dream beds with plush Euro-Top mattresses. Spa amenities can be added to Inside, Ocean View and Verandah staterooms. Cabins include a safe, mini-bar, hair dryer, DVD player and flat-screen TVs. Inside staterooms have a queen-size or two lower beds, a small seating area and a bath with premium massage shower heads. Two lower beds convert to a queen-size bed in the Ocean View stateroom. This room has a window or porthole, a comfortable seating area with small table and a bath with premium massaging shower heads. The Verandah Suites are furnished with a queen-size bed, a sitting area, a bath with massaging shower heads and floor-to-ceiling windows overlooking a private verandah. The Signature Suite includes a private verandah, floor-to-ceiling windows, a spacious sitting area and a queen size bed. A sofa bed can accommodate one additional person. The bath has a dual-sink vanity, full-size whirlpool bath and shower, and a separate shower stall. Neptune Suites have one king bed and a sofa bed, to accommodate up to four guests. Floor to ceiling windows open out to a private verandah. The bathroom comes with a dual-sink vanity, full-size whirlpool bath and shower, plus additional shower stall. Access to the exclusive Neptune Lounge and other free amenities come with this cabin option, along with a private concierge. The Pinnacle Suite is the largest stateroom onboard and comes with an array of complimentary amenities, including access to the exclusive Neptune Lounge. The bedroom has a king-size bed and the living area has a sofa bed. The suite includes a living room, dining room, pantry, microwave, refrigerator and a private verandah with a hot tub. 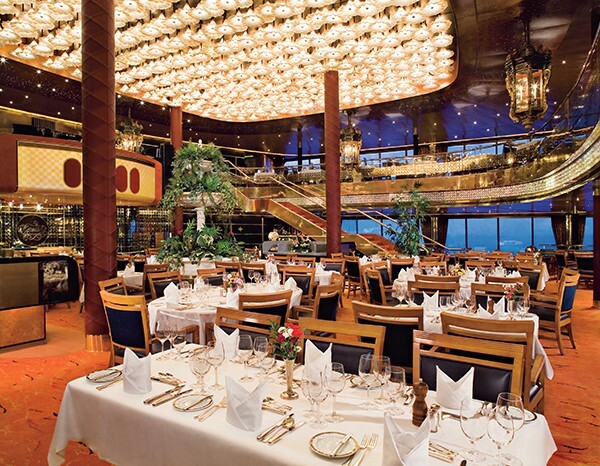 Entertainment on the Nieuw Amsterdam revolves around the cultural pursuits of music, food preparation and education. 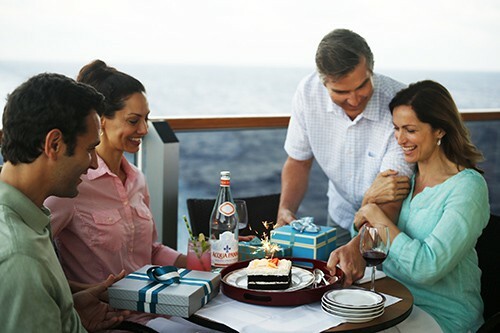 While on board guests can enjoy cooking classes and hands-on workshops from America's Test Kitchen. Video-editing skills are taught at a Digital Workshop powered by Windows®. Between seminars and presentations, guests can relax by the pool or rejuvenate in the Greenhouse Spa & Salon. The ship uses the innovative "Navigator" app, allowing guests to schedule activities, make show reservations and plan the day's entertainment.Every night of your cruise there will be at least one live performance in the three-story Mainstage theater. The performances range from music and dance to jugglers, magicians and comedians. The theater is also used for movies and bingo games. America's Test Kitchen conducts cooking demonstrations and classes like "We Love Chocolate" and "Lunch for a Rainy Day." For healthier interests, guests can try the activities planned by O, The Oprah Magazine. These include an early morning yoga/mindfulness session, a book discussion and seminars on healthy eating. Passengers can relax and rejuvenate at the elegant Greenhouse Spa & Salon, where spa services include facial treatments with naturally sourced ingredients. The spa's massage treatments employ time-honored massage techniques from around the world. For evening entertainment, passengers congregate around the Music Walk, where there are several musical venues and quiet bars. Head to the B.B. King Club for some traditional blues, or try the Billboard Onboard for a sing along with two pianos. Guests should check the Navigator for show times and themes because they change often, and some are not to be missed. Dining on the Nieuw Amsterdam is a highlight of every cruise, with a Master Chef making sure food and presentation is nothing short of perfect. Children's menu, vegan and gluten-free options are available throughout the ship. Main Dining Room - The large circular dining room is a two-story venue open for breakfast and dinner with a variety of menu options, including vegan, vegetarian and locally inspired cuisine. Dinners are served in four courses, so appetizers, soup and desserts are included. Traditional dinner seating times are 5:45 and 8 p.m. each night, with open seating between 5:15 and 9 p.m.
Lido Market - This buffet at the top of the ship has great views through floor-to-ceiling windows and is open for breakfast, lunch and dinner. Lido is a marketplace-style buffet in a cafeteria setting, where passengers select items from various stations, along with several made-to-order options. There is no extra charge in the Lido Restaurant and it is open from 7 a.m. to 11:30 p.m.
Dive-In Grill - On the pool Deck, you can find the snack foods you crave at the Dive-In Grill: hamburgers, pizza, sandwiches and Nathan's Famous beef hot dogs. Open for 11:30 a.m. to 5:30 p.m.
New York Pizza - The pizza is served hot and delicious, with a variety of toppings. There are five daily featured pizzas, but guests can request their own toppings. Salads and desserts are also offered. Open 11:30 a.m. to 11:30 p.m. Afternoon Tea - Served every afternoon at 3 p.m. in the Pinnacle Grill, afternoon tea offers a variety of teas, finger sandwiches, pastries, scones and a variety of sweets such as profiteroles, tiramisu and fruit tartlets. Rudi's Sel de Mer - Once a week, the Pinnacle Grill becomes a seafood restaurant, serving up seafood in a traditional brasserie setting, in which fresh fish and shellfish are brought to your table so you can choose. Sel de Mer serves classics such as escargots bourguignonne, bouillabaisse and salt-crusted whole fish, sometimes procured locally at the pier. Cost is $49 per person. Tamarind - The restaurant is decorated in an Asian motif with soft lamp lighting, velvet chairs and quiet music. 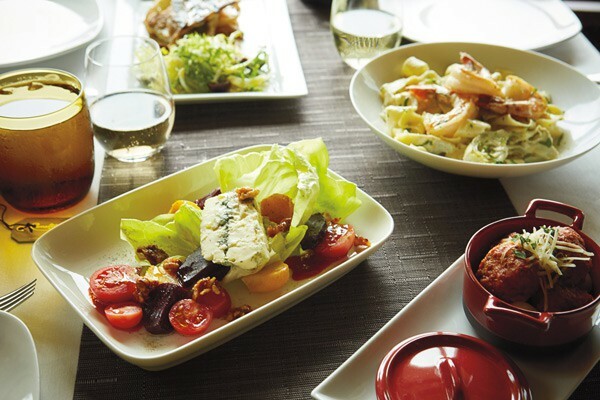 Food at Tamarind is Pan-Asian with dishes from Indonesia, Malaysia, Thailand, China and Vietnam. A large variety of Asian delicacies, from dim sum to sushi and curry, are served every night for a $25 per person fee. Open for dinner.